College basketball is a coaches's sport. The guys in the fancy suits are the names. They are the familiar faces on TV. They pitch the products. While their football counterparts certainly get accolades, basketball's nature directs much more visual attention to the head man. And what sort of traits fit into the stereo-typical college basketball winner? What would you want and expect if you were building a college coach from scratch? 1. Vocal 2. Passionate 3. Great salesman of the program to fans and recruits 4. Capabable of Xs and Os to overcome talent gaps. 5. A grinder/workaholic. Al Skinner is not your prototypical college head coach. And that is probably his biggest problem. In this interview with the Globe, Skinnner states that he wants to coach again. He also says it is important for him to coach in a major conference. Given the tone of the piece and the lack of gossip surrounding Skinner, I don't think many are calling. But why? Al's age is probably a factor. Hiring a fired coach is always tougher than hiring a rising coach. But I think Al's biggest challenge remains perception. Why would a school hire an unassuming, laid back coach when there are dozens of so many young coaches who have the potential upside and wear their emotions on their sleeves? I am not here to rehash the Skinner firing at BC. I disagreed with Gene's move but like Donahue. I also agree with those who felt Skinner and BC basketball had become stale. But regardless of how it ended you cannot question Skinner's success. Al has an incredible eye for coaching and player talent. He had a deadly efficient offense. He's a much better game manager than people realize. I am confident that Al could go to any BCS program and have them in the tourney within four years. But I don't think it is going to happen. I think if Al wants one last run, it will have to be at a smaller school. I loved the Al Skinner era at BC. A big part of that was the identity his teams had and his ability to win differently. I also think many of the complaints regarding Skinner are mistated and uniformed. Al Skinner is a great coach. He deserves another chance and any school that rolls the dice with a young unproven coach is missing on a sure thing. As a fan who loved Al Skinner and felt sorry to see him go, I thnk your analysis is right on. Al took a program in tatters, molded it into a consistent winner and guided the team to some incredibly exhilirating heights. I sincerely hope and am optimistic that Donahue can do the same and maybe more. Al went 15-16 last year with much more talent that Donahue had, including Sanders who is a decently talented player. Donahue lost Sanders, an entire recruiting class, and was forced to start walkons all season and yet he managed to win 21 games. 2 years before that, Al managed to win only 14 games. Face it, once Al lost his assistant coaches, his success tanked. Even when his teams were good, BC found a way to underachieve come tournament time. 1 Sweet 16 in his entire tenure is pretty pathetic. Donahue is a much better motivational and tactical coach. He gets the most of the talent that he has. The entire article sounded like sour grapes from Skinner. I read it days ago so I'm paraphrasing, but his comment bothered me about how he thought they could have been in the hunt for a title this year. If that is the case, why were they so awful last year? Last year's problems weren't just record, they were effort and attitude. Al's last BC team had the same roster PLUS Rakim Sanders, Evan Ravenel, and Tyler Roche; MINUS Gabe Moton and two walk-ons Rubin and Cahill. Al, we fans thought you had a dog in the race LAST season, what happened then? That said, I hope Al gets a good job again. 1. Al's "eye for talent" doesn't do much good if he's not out there recruiting, now does it? The most interesting part of the Globe article is that his former assistant (O'Shea) essentially admitted that Skinner has no interest in recruiting. 2. Four years to turn a program around? Maybe it's unfair but that's a long time to give a coach that a BCS team is taking a gamble on (and yes it will be a gamble -- no fans are going to laud the hiring of AS). Al did great things for BC and certainly brought the program to a new level, but as much as you deny it he reached a point where a change was needed -- if only to shake things up. CEW -- if Skinner did such a great job, why does Donahue need to "mold a program in tatters?" My syntax might have been a bit off but I meant that I hope Donahue can mold the team into a consistent winner and guide the team to some great wins and outstanding seasons, as I believe Al Skinner did. There is no objective argument that the program was in tatters when Donahue took over and I certainly do not believe it was. The program was struggling and stagnant then but in no way was it in tatters. I enjoyed watching the teams Al Skinner coached and I wish him well wherever he ends up. I think he will be successful at his next stop. Just as a last note, a program cannot be in tatters if the departing coach leaves behind a player that ends up the next season as first team All-ACC and another player that ends up third team. I am in agreement. I appreciate what Al did on the heights, but just a thought -- why not coach at a mid-major? He doesn't like to recruit and seemingly doesn't handle criticism all that well. At a mid-major he'd have less pressure, more emphasis on coaching and less on recruiting, and the chance to develop the next Butler, Cornell, or VCU. Was Al even considered for the PC head coaching job? Ohhh man. I had jokingly said he should throw his hat in the ring for the Fairfield job but this would just be hilarious. yesterday he posted a link about BJ Raji from 2 years ago. Now look at this headline: "The challenge with being a contrarion"
I'm pretty sure Al didn't recruit Danya Abrams to BC as the article says. Pretty sure Danya never even played for Al at BC. Speaking seriously, that would be a really smart move on Cooley's part. Al has been around the block, and knows basketball really well and can serve as a sounding board for Cooley. Al might not like recruiting, but let young Blaney and the other assistant beat the bushes for players. Then have Al be like a crosschecker. Having said that, as a head coach Al would be best served going someplace like a Fairfield. Again, he'd need assistants to do the recruiting. However, his "diamond in the rough" recruiting, plus his adherence to the flex, would have more room to pay off in a mid-major conference. It was a typo. Stuff happens. I am often writing this stuff late at night. A couple of misconceptions regarding Al. 1. He still recruited. 2. His good assistants didn't just leave the program. Mo Cassara proved this year that Skinner still had talent on his staff. 3. I like Donahue, but think with Sanders, still running the flex and some contribution from Noreen would have had us a little bit better and probably a tourney team. I think Donahue has a lot of promise. I just don't think we need to rewrite history in order to bury Skinner. I agree w/ ATL completely on Al. As to the notion of sour grapes I think he showed great restraint w/ his comments as he always did when he was our coach. The thing that has bothered me most in this whole saga is how BC just trashed the guy after all he did for us, who else could have fed Ryan the info about being lazy and all. I think Donahue has shown he is a good coach and am glad we are not looking at a Wake type situation, but he has to put up allot more numbers here before he can even be mentioned in the same league as Al. Al Skinner seems to be an ideal coach for the Pros. His style and demeanor are exactly what are needed in an NBA job. You may recall Jared Dudley's comments about how he was ready for the pros since his hands off experiences with Skinner were very pro like. Its a mystery to me why Skinner has not been an NBA job candidate, either as an assistant or head coach. As to Skinner at BC, he lost me when he went an entire year w/o signing a single recruit. The change in his attitude that went with that oversight seemed to seal his fate, even with GDF. BC will continue to be hurt by that "lost year" for next season. Lets hope Donahue's system and his recruits have the staying power to continue to cope with the ACC or that he can make adjustments as needed. Agreed -- really didn't need a "leak" to the Globe. As I somewhat implied earlier, he was routinely spotted playing pickup games around the plex, known for showing up to the office whenever he felt like it, and obviously had a general cavalier attitude towards recruiting. I'm not saying that this makes him a bad coach -- as Skinner points out, he got results so who cares how he did it. The problem is that when you're in the public eye and responsible for putting a**es in the seats you need to project the appearance that you're doing everything possible to make the team better. Maybe the best work advice I ever received came while working as a dishwasher at an Italian restaurant: "Look like you're busy." Skinner got to the point where he no longer gave off this impression. I'm not trying to bury Skinner since he's left. The program is where it is today BECAUSE of him. But, as coaches use schools as stepping stones to bigger and better things, so too can schools use coaches as a rung on their ladder in growing the program. One final anecdote – in Donahue’s final year at Cornell, the season in which they made their unprecedented run to the sweet sixteen, all eleven or so players on the team lived together. Not in the same dorm; in one house, by themselves. Donahue inspired such camaraderie among his players that not only did they want to play together, but they chose to eat every meal together and spend all their spare time with one another. I could never see Skinner and his Dudley-described “hands off approach” imbuing anything resembling this type of togetherness in his players, even in the Dudley/Marshall/Smith years and especially not in the Tyrese Rice years. This is why Skinner had to go, and this is why I am positively ecstatic about what Donahue can do for BC. He absolutely destroyed the projections for this year’s team and has a top 100 recruit along with a bunch of “his guys” coming in. We will have a true center (and please don’t pretend Josh Southern was) for the first time in years. Things may not be sunny on the Heights yet, but we’re certainly headed in the right direction. I, for one, am excited to see where this goes. Skinner has a right to some degree of "sour grapes". He was criticized openly right after being fired in a way that was not merited given his performance. Skinner did a good job but his results had started to flag. Maybe it was time to part ways but the way BC chose to do it was not nearly gentlemanly enough given Skinner's work. I have great affection for Al Skinner because of what he achieved for BC basketball. I don't think there's anyway to overstate his achievement. Al's teams were always effective and efficient on offense, even if some did not like watching the flex. In fact, they got more effective and productive during his tenure. But during that tenure, Al became more and more hands-off both in practices and recruiting. He was a master delegator and he hired people who did their roles well; his stars were natural leaders and instituted a culture of self-reliance around the program. Al was, by his own admission, hands off. But post-2007, Ed Cooley and Bill Coen left for Fairfield and Northeastern respectively. His lengthy run of self-starters leading the team (Smith and Dudley) was broken. He had two under-achieving teams while that infrastructure was in place (2001-02 and 02-03, again b/c neither Bell nor Sydney was a self-starter), but Jared Dudley was on the horizon. Then he had two under-achieving teams in a three year stretch (2007-08, 2009-10), and in the intervening year his team got blown out in the first round by a USC team that ran the same play 35 times in the second half (Taj Gibson says hi). And Jared Dudley was not walking through that door. Bad years became sub-.500; good years were bubble years. Bill points out that he had one talented assistant in Mo Cassara. 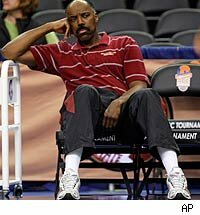 Ask Mo what he was allowed to do when he was an assistant at BC. He lucked into a Hofstra job where he has demonstrated talent; he did not exude it at BC because he was not given the opportunity to do so. Meanwhile, BC's defense went from bad to horrible to non-existent over Al's last five years. There were no strategic changes made to address that; no coaching changes made to improve it. Our recruiting slammed to a halt. Literally. He appeared content with Trap and Raji playing out of position, and Josh Southern at center. Did you notice a PG recruited to replace Ty Rice? Me neither. How about a true PF? Haven't had one since Craig Smith graduated. So the program was on the decline; there's no denying it. Over a long tenure on the Heights, Skinner became a delegator; and it worked. That is, it worked until it didn't --- until the guys on whom Al depended left and succeeded elsewhere. As his staff failed badly, Skinner may or may not have reasserted himself. If he did, it was not apparent on the court or on the recruiting trail. As his coaching career trended upwards, Al took great pride in carrying himself as a laidback guy. He was the guy who, correctly, did not think basketball was rocket science. He did not talk about how hard he worked --- in fact, he thought that was reserved for the scumbag coaches who were working hard to break every rule but just talked about the "work" and not the sleaze. He was right about that too. But he took it too far: in December of one of his later seasons, he bragged about not knowing anything about how the conference would play that year --- he only watched "the League," he said. And he arrived on campus at midday...to play pickup, and then got to work. Andy Katz reports that he was working at home all of those mornings; if so, why not invite Andy or Blaudschun or someone to his home, watch tape with them. But Al didn't want to. He liked being portrayed as the guy who succeeded without taking it all so seriously. And being the guy who succeeded without breaking the rules. He didn't accomplish any of that without a LOT of hard work; but he never showed it. In fact, he took pride in hiding it. So now he's a coach who has had success, but is removed from it. A coach whose quirks are funny --- how many NCAA coaches will chat up reporters about the merits of NBA teams? --- when he's winning. And whose quirks don't look so good when he's not. A guy who was a delegator who lost his ability to hire guys to whom he could effectively delegate. And a guy who always tried but pretended that he didn't. Any wonder major conference programs are passing him over? There's none here. For all the Donahue lovers out there. His teams the first 7 years stunk in the Ivy. If he stayed one more year at Cornell would he have been successful? I think not. Seems he left a program in tatters 10-18 this year. I love that people like "Donahue's system" Paul Westhead had a system. I do know this. BC hoops from 2000-2010 was exciting every year. I could give a crap about his style of play. I like wins. It took Al 3 years and we were in the top 10 and 27-4. And he took over a much worse situation. It is only natural to be excited about a new coach who was relatively successfully this year (and successful last year). Especially given his lack of talent. And do you really think BC Basketball was exciting last year? Really? BC had some really solid years under Al, and you have to give him credit for those. But there were no spectacular years. I mean, one Sweet 16 in all those years. That is not an amazing run, just solid. I think another overlooked aspect of Skinner getting fired was the administration getting sick of the team's character problems. For as many solid, upstanding young men as Skinner brought through (Troy Bell, Craig Smith, Jared Dudley, Uka Agbai, Louis Hinnant, Reggie Jackson, and others) there were a lot of kids who were either so bad they got kicked out (Ryan Sydney, Andrew Bryant, Sean Williams, Akida McClain, others I'm forgetting) or had serious attitude/work ethic problems (Shamari Spears, Rakim Sanders, Tyrese Rice a little bit). Gene made it a point when commenting on Donahue's first season to note that the team's cumulative GPA was its highest in a long time. That stuff matters to the administration, as well it should. You had me up until "as well it should." Is Patrick a euphemism for "Gene?" Patrick actually has much more respect for Al Skinner's record of accomplishment than Gene DeFilipo's --- as Al actually played a large role in his major achievments (Big East championships, NCAA bids) while Gene's great achievement (our ACC invitation) had much more to do with BC as an institution than anything he did. I loved that Gene made the move to fire Al, because it was time. And I love his hire of Steve Donhue. But those two things are the only entries on the list of "things Gene has done over the last 6 years that I agree with." TOB and Al were pretty much one of the same. Al did have a little more success (actually won a conference title), but they were fired for the same reason basically. Neither coach could bring their program to the next level. TOB could never get over the hump and win a big game to get BC into the BCS (he choked numerous times). Al could never get the basketball team over the hump to become a consistent deep tournament team. In fact, Al's teams rarely had success in the tournament. The fact that Al only got into the Sweet 16 once with the talented teams he had was pathetic. Bobby Cox and his 1 World Series comes to mind. Both Al and TOB were fired because their programs stagnated. The basketball team now has a chance to improve with Donahue. The football team on the other hand is still mired with a TOB clone. Paul Westhead had "The System", the original "run & gun". His LMU teams were fun to watch and had NCAA success. I know, I know his teams didn't play defense; but, man, did they score points! Al's teams didn't play defense either; but they often had trouble scoring. If you gave me a choice of watching "run & gun" versus the "crammed in flex", I'd take the offense. The empty seats at Conte at the end of the Skinner era indicate that BC fans would probably agree. Patrick if your post is an homage to Al's hilarious use of the 3rd person in the Globe article then well done, sir. “Al Skinner was never the most talented guy on the floor as a player, but I competed as hard as anyone,’’ he said. “I did the same thing as a coach." Lets face it. It was time. Time to breathe some life back into a program that had become stagnant. Al Skinner did a very good job over his tenure, some exciting players, numerous tournament appearances, etc. However, the repetitive nature of coaching weaknesses, including, but not limited to breaking a press, mis-use (or should I say non-use) of Time Outs to break opponents momentum, one dimensional offense (a compact flex), total lack of enthusiasm and support from the bench, and a frustrating dis-interest in any marketing of the program designed to increase the dismal attendance, all were justifiable reasons to make a change. We must move on, but also acknowledge the accomplishments of an honorable man (Al Skinner), and recognize the reality that his effectiveness had seriously declined. P.S. Where were the students this year?---certainly not at Conte Forum. Embarrassing!